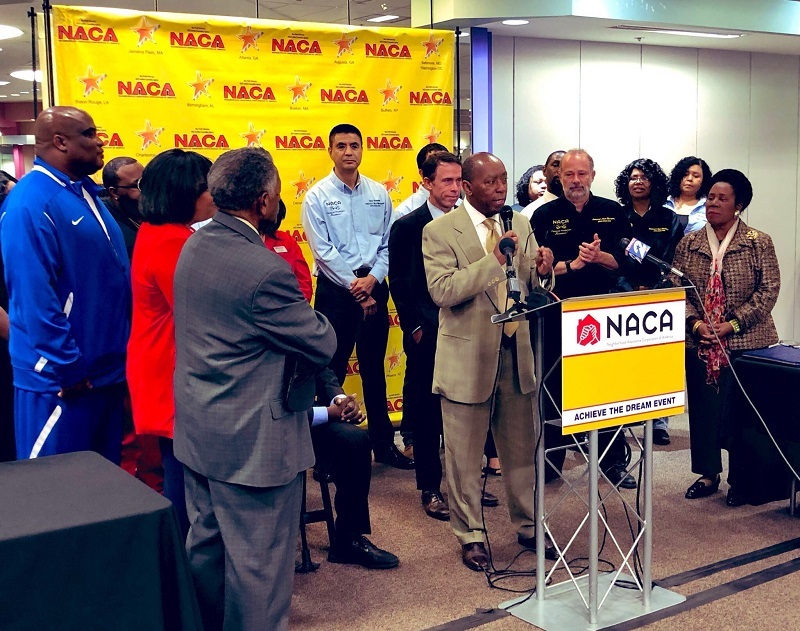 March 22, 2019 -- Mayor Sylvester Turner joined NACA’s CEO Bruce Marks, a Bank of America executive. to announce a commitment of $100 million of the Best Mortgage in America to Houston homebuyers. This will create unprecedented homeownership opportunities in Houston for low and moderate income buyers by breaking down the barriers that prevent many working people from buying a home. The NACA program features no down payment, no closing costs, no PMI, a below market fixed rate, without consideration of one’s credit score. With Houston’s financial assistance and other funds, homebuyers can buy down the interest rate to virtually zero percent. Additionally, grants are available from the City of Houston to permanently buy down the interest rate on the loan. When combined with the $30,000 grant available from the City of Houston, a NACA homebuyer with a $200,000 mortgage can buy down the interest rate on the loan to a fixed rate of virtually zero percent for the life of the loan. "This is one of my priorities. I want people to live and work in the City of Houston," Mayor Turner said. "We are the fourth largest, and most diverse city in the country. We need the best and brightest to be able to afford to live in Houston and contribute to the city of the future." NACA’s Achieve the Dream Event continues each day through Sunday at Greenspoint Mall, with doors open 8:00 am to 8:00 pm. All NACA services are free, and more information and event registration can be found at www.naca.com. Walk-ins are welcome. NACA provides the same terms for all borrowers, many of whom had previously given up on homeownership. As Forbes magazine observed in their comparison of the best low down payment mortgages, “There is one exception, NACA, that charges the same rate regardless of the credit score”. Bank of America has committed $10 Billion to the NACA mortgage program nationwide. © . All rights reserved. City of Houston.